A spacious 2 Bed 2 Bathroom ground floor apartment with a large terrace overlooking the enclosed communal pool buit in a small secure development. The apartment is new and modern inside, accomodating up to 6 people. The lounge/diner opens out onto a large patio which overlooks the pool. This room is equipped with lcd tv, dvd, cd and english satelite tv along with a sofa bed if required. Along the corridor there are two spacious double bedrooms, one with a kingsized bed and en-suite bathroom with shower and bath the other with twin beds. Both rooms have large built in wardrobes. The other bathroom is equipped with all the usual amenities along with a shower cubicle. The galley kitchen which also opens onto the patio has all the everyday amenities including washing machine, fridge freezer, oven, hob and microwave. All three rooms are equipped with air-conditioning which can blow hot or cold air depending on the temperature required. Easy access for pushchairs/wheelchairs along with parking available at the rear of the building. Travel cot with bedding,bed guard and highchair available. Welcome packs including wine and beer are available on request at 20 euros. 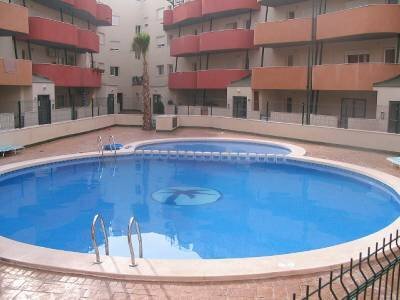 Situated in Almoradi - a lovely typical Spanish town located in the province of Alicante on the northern side of the River Segura in Costa Blanca. Alicante airport is approx 40km away with Murcia airport less than 50km. Costa Blanca is without doubt a golfers paradise La Finca Algorfa golf club is a few minutes drive down the road along with five other courses all within 30km. A bit further away is La Manga Murcia golf course - one of Europes premier golf destinations which has 3 x 18 hole championship courses. Almoradi town is only a five minute walk from the apartment offering you amazing tapas bars and restaurants catering for all tastes along with a variety of shops/supermarkets. Not to be missed is the famous Saturday market held around the attractive main square. Lovely sandy beaches are only approx 10km away at Guardamar and La Mata with more choices further afield. Torrevieja is only approx 30km away - a typical seaside resort with sea front promenade, lively nightlife, nightclub, bowling, cinema, casino, water park and hypermarkets. With Almoradi only 5 minutes away from the motorway, Alicante, La Manga, Elche, Murcia and Benidorm are just a few places within easy driving distance offering you a variety of tourist attractions from water/theme parks to caves, castle and even a zoo. In all this area is ideal for most people from families to golfers as it offers a variety of entertainment all within easy reach.